I had to chuckle at this recent Instagram post by @zerowastechef, in which she highlighted in a mirthful way some of the side effects of her zero waste lifestyle. As I was prepping sauerkraut today, while waiting for the sourdough loaf to cool, I was mulling over some of the realities of my approach to life, which celebrates raw materials and the making instinct (which is just another way to describe a “lifestyle” similar to that of @zerowastechef). I’ve developed two perceptions of making and time: hands-on and hands-off time; active making and passive making. 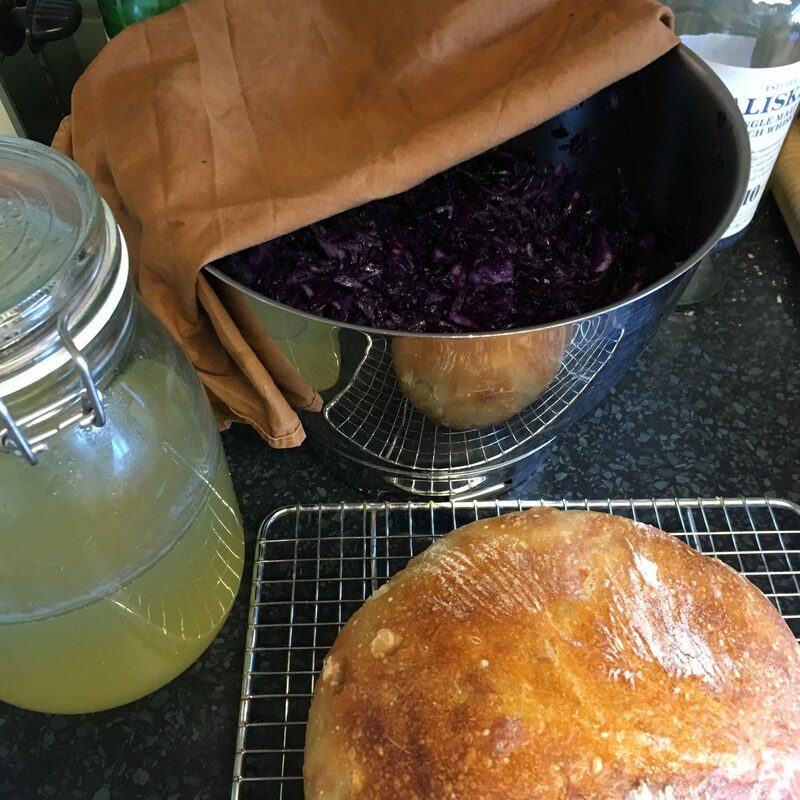 The three ferments above (sauerkraut, sourdough and scrap vinegar), as well as the naturally dyed napkin, involve hands-off time as an ingredient. My hands-on time for these makes is minimal and is only intended to kickstart the process so time can do most of the passive work. I never have a completely clear kitchen counter, windowsill, desk… There will always be a corner with projects that are “brewing”, growing or waiting for the next pocket of time in a schedule that revolves around seasons, logistics and holding patterns. Focusing on raw materials and simple making processes definitely involves going back to minimal materials and methods but it is far from visually/aesthetically minimalist. In light of the above two side effects, I have developed a mindset focused on logistics rather than problems, chores, workloads… Instead of thinking “I can’t do xyz because abc”, I have a “how can I get xyz to dovetail with abc” attitude and delight in figuring out holding patterns and flows of materials and tools for my craft-full life. I don’t only hoard jam jars; I also squirrel away used bottles with strong stoppers for future use. Think whisky, port, sherry… bottles and the ultimate prize, a bottle with a ceramic and rubber clip-top lid. I never have enough tea towels, dish clothes or napkins, whether to wipe down surfaces after the modest hands-on/active work or to cover doughs, mixes and brews while time and the enzymes on the air do their work. By the time I realised this though, the materials and making mindset was so second nature to me that I had already started to scavenge cotton from old shirts or bed clothes to turn into napkins and kitchen cloths. My tastebuds changed radically. Processed food tasted increasingly bland – not bad per se, just not really like anything at all. It was this shift, I suppose, that drew me ever deeper into a way of life that focuses on materials and making. And more tasty food (like warmer knits and more comfortable clothes) definitely makes up for surfaces that are never clear of a project or two. Finally, I’ve made new friends and deepened relationships. 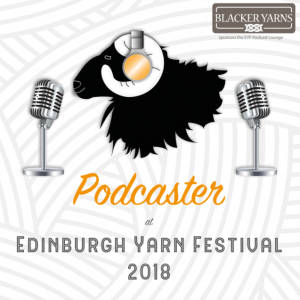 Making (whether knitting, dyeing, cooking, fermenting…) cultivates generosity and sharing, from sharing know-how to the informal exchange of makes. These qualities build relationships and community, and generally make life much jollier! I am intrigued to know, what unexpected side effects has a shift to making (in whatever form) meant for you? Or are there any practical side effects that have put you off adopting a more craft-full life? Interesting! I am a bit of a WIP in many ways in this regard. Having only moved here recently, it takes time to get settled and figure out the seasonal rhythms and what will work or not work. My making has to dovetail with the work on the farm & the various making projects must dovetail with each other. My free time is mostly in the middle of the day, bookended with chores/milking. I like to spend time with my husband in the evenings relaxing. So ideally, my sewing/embroidery and weaving will be daytime activities, with spinning/knitting as evening activities. Right now, I have no system, but …with sooo many projects in mind, I will need one! But it is fun to think about and there may end up being a bit of seasonality to it all as well. We shall see! The big renovations are finished and my garden is mostly finished, and in a few years we should be able to shift away from milking. So that will again open up some windows for shifting things around.